It is natural for all equines to grow a thicker coat in the winter, to help protect them against the harsher weather. However, this thick and heavy coat can pose a problem if you choose to continue exercising your horse over the winter, as your horse will become hot and begin to sweat, depending on the horse’s condition, their breed, the thickness of the coat and how hard they are asked to work. Excess heat can lead to a horse feeling particularly uncomfortable during exercise, often causing a decrease in the level and quality of performance. Sweat on the coat can also take a long time to dry completely in the colder winter weather, lowering the horse’s core body temperature and leading to an increased risk of the horse catching a chill or having problems maintaining weight and condition. If a horse maintains a steady exercise regime throughout the season, clipping can be beneficial in helping to keep the horse cool whilst working and enabling the coat to dry quickly, as well as looking smart and making for quick and easy grooming! Always ensure that your clipping area is safe and secure, close any yard gates and check that the floor is clean and dry. Electric clippers should always be plugged into a circuit breaker as this will cut off the electricity in an emergency. Ensure that your blades are sharp and tensioned according to the manufacturer’s guidelines and remember to oil the blades and clear the air vents at regular intervals. Over tensioned blades will get hot quickly and under tensioned blades will fail to clip effectively. Safety comes first, so wear a hard hat, especially when clipping a young or nervous horse. Always have a helper on hand. 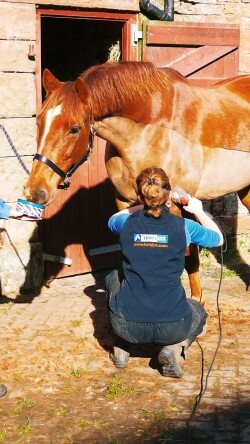 Plait the horse’s mane and tail to keep them clear of the clipper blades. Ensure that your horse is clean and dry before you begin clipping, as dirt will quickly blunt the clipper blades. Opt for the minimum clip that your horse needs, remember you can always take more hair off, but you can’t stick it back on again! When clipping lines, follow the natural contour of the horse’s muscles and conformational points. If you have a young of particularly nervous horse, use a distraction such as a haynet or treats to settle them around the clippers. Mini Horslyx can be used as a treat or a distraction and are especially useful during stressful periods, including clipping. Mini Horslyx provides a balance of high specification vitamins and minerals, helping to keep equines in all round top health and condition. Available in four formulations; Original, Garlic, Respiratory and Mint, Mini Horslyx are the ultimate indulgence or treat, without any added sugar, artificial colours or preservatives, perfect for good-doers or equines prone to weight gain, without causing fizzy behaviour. The hand-held 650g packages are easy to handle as a simple reward or distraction, ensuring that your equine gets the nutrients that they need, whilst you get the job done with minimal protest! To see a video on using Mini Horslyx to help make clipping stress-free click here.